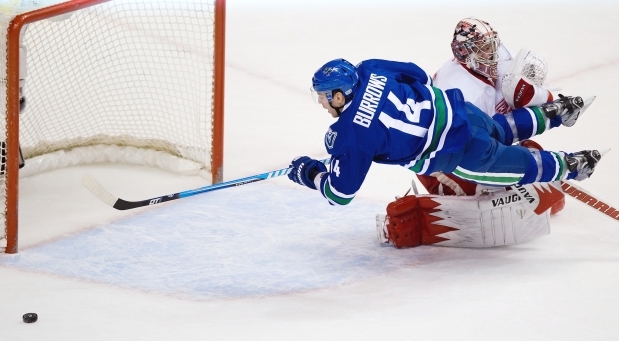 A summary of Burrows’ “puck luck” summed up in one picture. Puck drop is 4:30 pm/pst tonight against the Detroit Red wings at Joe Louis Arena. After serving his 15-day suspension for going off the rails, er, “off the country” against the Calgary Flames, Canucks head coach John Tortorella is back behind the bench tonight as they face the Detroit Red Wings for the second and final time this season. It probably couldn’t have come at a better time either, with the team struggling and losing playoff ground. Not too long ago, the Canucks seemed firmly in a wild card playoff spot, even threatening to overtake the Los Angeles Kings for 3rd place in the Pacific Division, but thanks to their 4-9-2 record in January are now just 2 points ahead of the 9th place Phoenix Coyotes and only 4 points ahead of the 13th place Winnipeg Jets. With defensemen Kevin Bieksa, Chris Tanev, Yannick Weber and Andrew Alberts all still in the infirmary, the Canucks yesterday called up Yann Sauve from the Utica Comets, and this morning acquired Raphael Diaz from the Montreal Canadiens, giving up the Dutch Gretzky, Dale Weise. The defensive help will be welcomed, but they’re still woefully short up front with Henrik Sedin and Mike Santorelli still out as well. Likewise, the Detroit Red Wings have injury concerns of their own. Pavel Datsyuk, Johan Franzen and Stephen Weiss are all nursing injuries. If there’s a silver lining in all of this, it’s that Ryan Kesler seems to be awakening from a month-long slumber. Without Hank in the lineup, Kes has taken on top-line center duties and has 4 points (1 goal and 3 assists) in his past 2 games. For the Red Wings, Gustav Nyquist, Henrik Zetterberg and Justin Abdelkader has picked up the scoring slack, accounting for 5 of Detroit’s 8 goals this weekend. Nyquist, in particular, has been hot, recording a hat trick yesterday, and he now has 8 goals and 11 points in his past 7 games.